Adult Swim's mega hit dashes onto the iPhone in all its rainbow spewing glory. 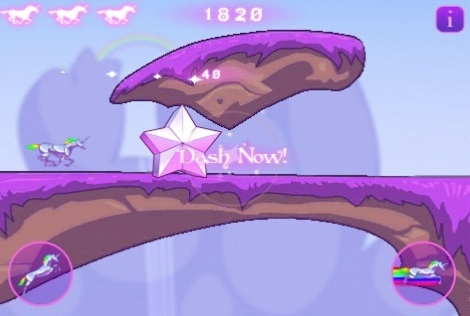 Robot Unicorn Attack began its life (magically, of course) as a free flash game on the Adult Swim website. Now, with over 22 million plays later, the enchanted powers that be brought this shameless and addictive gem to the iPhone and iPod Touch, and it's just as wonderful as its PC counterpart, minus the $2.99 entry fee. Much like Canabalt, another quality iPhone game, the goal is to continue running forward until the hero dies. Except instead of playing as some nameless dude clearing buildings, you control a robotic unicorn that leaves a trail of rainbows in its wake and uses its powerful horn to destroy gigantic stars. The longer you travel and the more things you destroy, the more points you receive. Make it far enough, and metallic dolphins swim alongside the unicorn. It's cracked out stuff, especially when you take into account the fairies, pink/purple fantasy world and the cheesy (yet extremely catchy) song Away (from the group Erasure) constantly playing in the background. Obviously, the big draw is to see how far you can get. 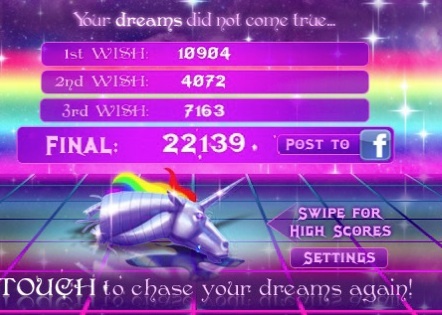 You receive three chances (called wishes) each time you play, and the game totals them for a final score that you can post to Facebook. Unfortunately, we couldn't locate online leaderboards, but those may arrive in a future update. Meanwhile, and for whatever strange reason, Robot Unicorn Attack costs $2.99. While that's acceptable for an iPhone game, keep in mind that you can enjoy this title free of charge on a PC or Mac. The decision to cough up the dough for the portable version, of course, is up to you. That said, we strongly suggest buying (or at least playing it on a computer) ASAP. Robot Unicorn Attack is a simple to learn and delightful casual game that you'll enjoy for weeks and perhaps even months to come. Besides, every good unicorn deserves a home. What's Hot: Erasure, extremely addictive, easy to learn controls, slick fantasy background, a decapitated robotic unicorn, "You will fail!" What's Not: Costs three bucks while the PC/Mac version's free.